The sea caves along Apostle Islands’ red sandstone cliffs are some of Lake Superior’s most beautiful sights. In the summer, these stunning formations are best viewed on the water and explored by kayak. In the winter, the sea caves put on an entirely new spectacle. As the lake surface freezes, the waterfalls and giant waves that crash against the cliffs turn into breathtaking giant icicles and ice pillars standing out against the red cliffs. The result is an icy fairyland that has been described by many as simply magical. Unfortunately, there’s no guarantee that the ice caves can be visited every year. For example, after 2009, the ice caves had been inaccessible until 2014, or a good five years after. And on winters when visits to the caves are allowed, there are days when access has to be restricted because of unfavorable weather conditions. The mainland caves can be accessed from Meyer’s Road, located four miles east of Cornucopia and 18 miles west of Bayfield. The part of the lake in this area is often blanketed in ice, and if sufficiently frozen, the ice serves as a bridge where you can walk, snowshoe, or ski across to get to the caves. The nearest caves are about one mile from Meyer Beach, and the entire stretch goes on for a few miles more. Before heading to the location, check the weather conditions in the area at the National Weather Service website. The entire visit can take up to three hours, so consider if you and your family or friends can withstand the temperature for the duration of the visit. The ice can be extremely slippery. Wear sturdy boots and ice cleats. Ski poles can help keep you balanced. Temperatures can go below zero, and wind chills are common. Wear warm clothing, preferably layers you can peel off when the temperature rises. Be mindful of falling rocks and ice inside the caves and in the vicinity of the cliffs. 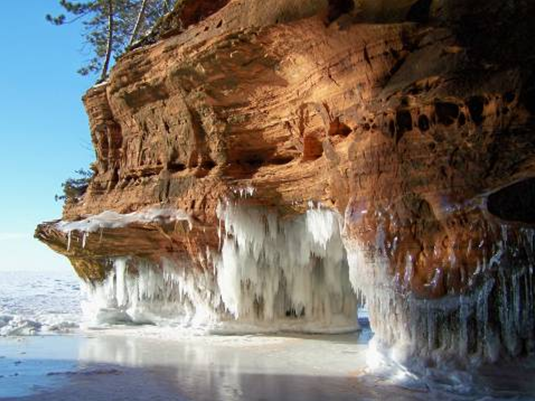 The staff of Apostle Islands National Lakeshore regularly inspects the ice and monitors the weather to issue an advisory on the caves’ accessibility. Access is only permitted when a “low risk” condition is in place. If there’s any threat that the ice will break or will not be frozen enough, or if there’s significant change in weather conditions within a short period, the sea caves are considered inaccessible. Generally, the ice bridge connecting the mainland to the ice caves forms by February and lasts until mid-March. As of January, 2018, the quality of the ice in the vicinity does not meet the “low risk” criteria, making the ice caves inaccessible for the second year in a row. The conditions might change, however, so it’s best to check on the resources given above. If you don’t get the chance to visit the caves in the winter, you can still marvel at their beauty in the summer. And they’re just one of the many unparalleled attractions in the Lake Superior South Shore area. Explore your real estate options here, as well as in Bayfield, Washburn, and other neighboring communities. Get in touch with us today! You can also call (715)779-5000.